The Petlyakov PE-2, known as the "Peshka", was a World War II Soviet light bomber. The Peshka was less well known than the famous Il-2 Sturmovik yet it was highly effective and one of the most important twin engine bombers of the war with 11,427 built (second only to the Vickers Wellington (11,462) among Allied twin engine bombers produced). Vladimir Petlyakov designed the PE-2 upon his release from prison (as were so many designers, when the War was imminent). The Pe-2 was originally designed to be a heavy fighter, however just before the War it was redesigned to be a dive bomber. It was ultimately used in a variety of applications including a standard light bomber, heavy fighter, reconnaissance, night fighter and trainer. Captured Pe-2s flew with the Finnish Air Force during World War Two and post War they flew with several Communist Block countries, providing us with a variety of non-Soviet marking options, although only wartime Soviet markings are provided in this kit. Kits of the Pe-2 in 1:48 scale have been few and far between. MPM Productions came out with a new tooling in 2000 and in 2001 they introduced two more versions with new parts for a trainer, and later a Pe-3/Pe-2 series 1941. I had the original kit in my stash, and I can vouch for its quality – for the time. Historic Plastic Models (HiMP) also has a short run injection molded kit that has a good review on Hyperscale and Koster Aero Enterprises has a vac kit but finding these older kits may be difficult – even if you wanted them. 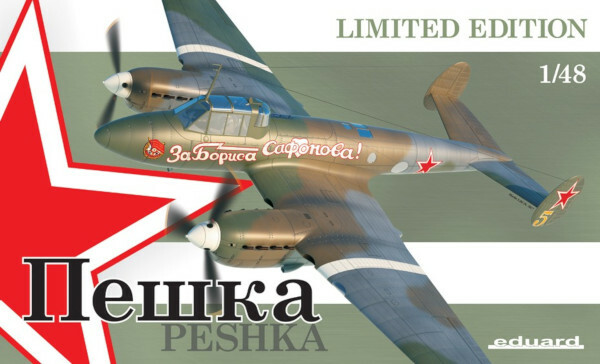 The good news is that Zvezda released a terrific new tool Pe-2 in 2015 that takes full advantage of the latest technology and it's this kit that provides the plastic for Eduard's Limited Edition version. Eduard has done this before of course, occasionally reboxing someone else's plastic. That plastic consists of 12 sprues with 336 parts inside a typical sturdy Eduard box. The moldings are excellent and the panel line and rivet detail is sharp and subtle. All of the control surfaces are separate. The kit gives tons of delicate interior detail and tiny parts. Great care will be need to remove some of the finer details like hoses and pipes from their sprues. I found a couple of the near hair thin parts were broken. A few parts had broken off and were floating in the bag. Probably the result of rough handling, so be sure to be careful. The kit provides one full engine to display as well as a detailed bomb bay, wheel wells and interior if you care to open these areas up. Parts also are provided for those of us who prefer that sleek, buttoned up ready-to-fly look. So what do you get in this Limited Edition box, in addition to the borrowed plastic? Let's start with the instructions. Instead of Zvezda's 12 black-and-white pages you get a 20 page, full color magazine style booklet with an extensive history and 46 step assembly diagrams. This includes full page, 4-view color illustrations of each of the five decal options. Eduard also includes two photo etched sheets. One is steel with seat belts and instrument details printed in color and the other unpainted brass with engine details and more. The PE frets add up to an additional 51 parts. As if all the above wasn't enough, there is the Eduard Pe-2 upgrade PE set (No. 49867). It consists of about 100 (I lost count about there) additional details, including steel color printed cockpit and interior radios, ammo belts, brass wheel well walls, bomb bay racks, landing gear and engine details as well as bomb fins and fusing spinners. Also, if you're interested in non-Soviet markings, Begemot offers aftermarket decals with Czech, Bulgarian, Polish, Finnish and captured German markings, ranging in price from $17 to $35, revealed by a quick online search. For a plane that played such an important roll in the war, it's nice to finally see a really excellent kit of it. Kudos to Zvezda for a great kit – and kudos to Eduard for taking that great kit up another level. The additional goodies they provide make this a near perfect kit. And then of course, they provide even more. In short, I highly recommend this kit! My thanks to Eduard and Internet Modeler for the opportunity to review it. Watch for my build review coming soon (or at least in a month or two).